In November 2017, under the leadership of George Mason University President Ángel Cabrera, a group of senior international education administrators met during the Association of Public and Land-grant Universities’ Annual Meeting to discuss the role that universities play in bridging nations and societies even in times when political winds may create some divides. The outcome of this discussion was an overwhelming sense that universities ought to reaffirm their commitment to global engagement and the necessity of such engagement to solve the world’s most pressing problems as articulated by the global community through the United Nations’ Sustainable Development Goals. In the months that followed, with continued leadership from President Cabrera and APLU's Commission on International Initiatives, a declaration was drafted articulating a set of commitments from public universities toward collective global engagement. In July 2018, President Cabrera and UNITAR Executive Director Nikhil Seth ceremonially signed the declaration to symbolize the United Nations' support of the efforts undertaken by our university community. We are pleased to invite presidents and chancellors from non-profit colleges and universities to sign this declaration to reaffirm their university's commitment to global engagement in pursuit of progress towards achieving the UN’s Sustainable Development Goals. 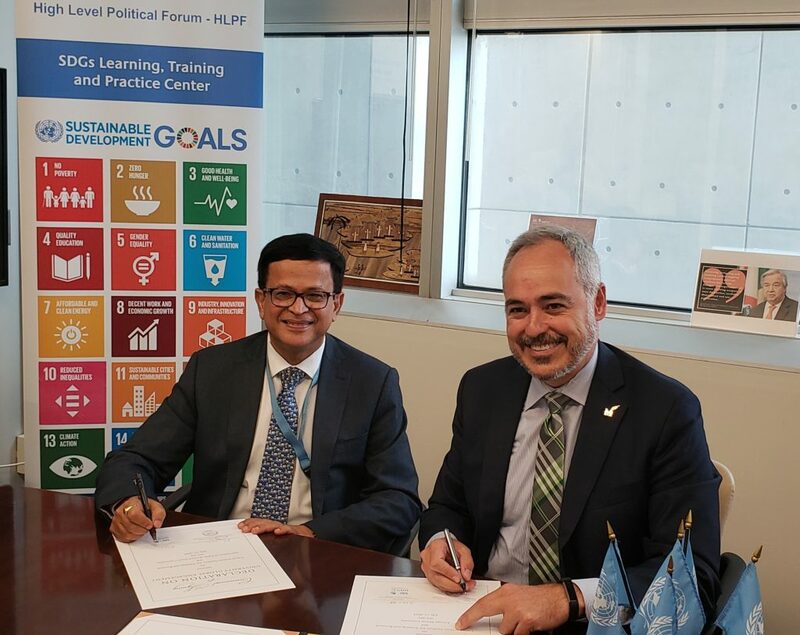 Ángel Cabrera, President, George Mason University, Chairman of the APLU Commission on International Initiatives, and Nikhil Seth, United Nations Assistant Secretary-General, Executive Director, UNITAR, jointly sign the Declaration on University Global Engagement. An autonomous UN body established in 1963, the United Nations Institute for Training and Research (www.unitar.org) is a training arm of the United Nations System, and has the mandate to enhance the effectiveness of the UN through diplomatic training, and to increase the impact of national actions through public awareness-raising, education and training of public policy officials. UNITAR provides training and capacity development activities to assist mainly developing countries with special attention to Least Developed Countries (LDCs), Small Island Developing States (SIDS) and other groups and communities who are most vulnerable, including those in conflict situations. APLU (www.aplu.org) is a research, policy, and advocacy organization dedicated to strengthening and advancing the work of public universities in the U.S., Canada, and Mexico. With a membership of 237 public research universities, land-grant institutions, state university systems, and affiliated organizations, APLU's agenda is built on the three pillars of increasing degree completion and academic success, advancing scientific research, and expanding engagement. Annually, member campuses enroll 4.8 million undergraduates and 1.3 million graduate students, award 1.3 million degrees, employ 1.3 million faculty and staff, and conduct $44.9 billion in university-based research. In November 2017, under the leadership of George Mason University (www.gmu.edu) President Ángel Cabrera, a group of senior international education administrators met during the Association of Public and Land-grant Universities’ Annual Meeting to discuss the role that universities play in bridging nations and societies even in times when political winds may create some divides. The outcome of this discussion was an overwhelming sense that universities ought to reaffirm their commitment to global engagement and the necessity of such engagement to solve the world’s most pressing problems as articulated by the global community through the United Nations’ Sustainable Development Goals.